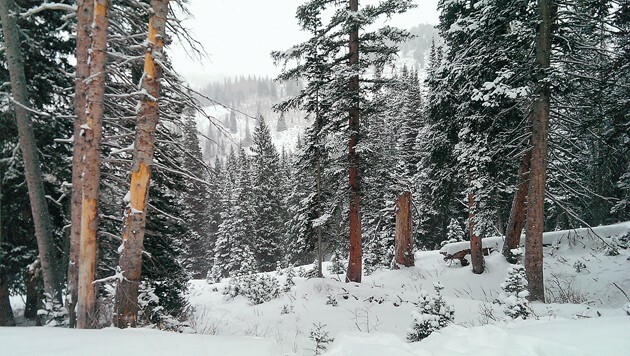 The forest surrounding Guardsman’s Pass Trail is covered with fresh snow. Although the snow is not deep enough yet for snowshoeing in easily accessible areas of Tooele County, Guardsman’s Pass at the top of Big Cottonwood Canyon has plenty. But before you go, there are several things you should consider about snowshoeing in the high country. First, what is the weather forecast? I love to snowshoe during a snowfall. But if the snowfall is heavy, visibility can be severely decreased, which could result in getting lost and a bad situation. It is best to snowshoe only when there is good visibility. Second, know where you are going. Get a good map of the area and research it so you are not surprised and get disoriented. Third, wear the proper gear to keep you warm so you can enjoy the experience. I recommend thermal underwear, snow pants/ski pants, ski parka, good warm gloves that won’t easily become wet, good warm boots, and some wool socks. Wool socks retain heat and they are good at wicking moisture away from your feet if they become hot and you sweat. You also need to layer clothing. As you exert yourself, you will perspire, especially if it is a steep grade or sunny day. I always wear a few layers I can shed and stuff into my light backpack. Fourth, make sure you have eaten recently and are well- hydrated. Hydration while snowshoeing is important. I carry a liter or two of water and some food in my pack. Tell someone where you are going, and if possible, don’t go alone. It’s a lonely time in the mountains if you are by yourself and something goes wrong in deep snow. Lastly, consider the environment and your knowledge of snow and avalanche mechanics. The Wasatch Mountains receive 600 inches of snow annually in the highest elevations and are avalanche-prone. Utah has an amazing resource to help you in this area. 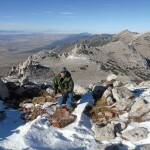 The Utah Avalanche Center maintains a website (www.utahavalanchecenter.org) where daily avalanche and highway conditions are posted. There is a lot of useful information on this website that can help you stay safe. Take the recommendations in the forecast seriously. Every year snowmobilers, skiers, snowshoers and other outdoor enthusiasts die because they triggered an avalanche and were not recovered in time. Such information is good to have if you venture off the trail through the pines or intend to climb the ridges and along the crests. The Guardsman’s Pass Trail is tame, yet beautiful. Persons of all abilities can enjoy the route. State Route 152 in this area after the locked gate is often hard-packed due to snowmobiles, so you could even walk in regular boots some of the time. Breaking trail in fresh powder is what I enjoy, so I tend to venture off when I can. The temperature read 10 degrees on our thermometer last weekend when my wife and I pulled up to the turnaround at the Guardsman’s Pass gate. The sky was gray and a light snow was falling as we retrieved our snowshoes from the back of our vehicle. The worst part about snowshoeing is trying to fasten the buckles with cold hands while you are bending over in the snow. After a bit of fiddling with frozen fingers and straps, we hit the trail. The mountains in this area are heavily forested with Engelmann spruce and sub-alpine fir. As we gained elevation, we explored on either side of the road through several feet of fresh snow. Snowshoes keep you somewhat on top of the snow, but when the powder is deep you can sink 6-12 inches in the white stuff. After another half mile along the trail, the clouds lightened up and revealed 10,116-foot-high Scott Hill. 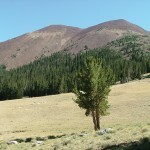 This is the highest peak above the Park City area. 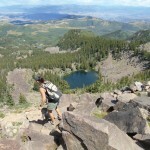 If you are interested in a longer hike, you can follow the road all the way to Guardsman’s Pass and from that point you can summit some of the minor peaks that are just under 10,000 feet in elevation. The bald summits are usually heavily drifted on the lee and windward sides but blown nearly free of snow on top. These areas provide good views. We found a rock outcrop outside of the wind on the eastern side of the summit of one of these peaks and ate our lunch. We looked out across the Park City crest in the vicinity of Deer Valley and it was an experience we won’t soon forget. Plan appropriately, don’t take chances, pay attention to the weather and enjoy winter as it has most certainly arrived in the high country. How to get there: Take SR-190 up Big Cottonwood Canyon about 16 miles. 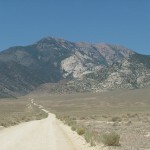 Just before Brighton, turn left onto SR-152, which is known as Guardsman’s Pass Road. Proceed for .9 miles to a locked gate. The road is plowed to this point. There is plenty of roadside parking, a few interpretive signs (if they are not buried by snow) and vault toilets. If there is snow on the road, you may need four-wheel drive or chains.